Which is the right spiritual tool? That is a question that often comes to mind in selecting a Bible or story book for a child. You realize that it’s as important for a young person as for an adult to hear what God has to tell them in His word. But the lessons should come from God, not from America’s next best-selling author. Paul Miller, who writes under the pen name, Olin Edward James, feels the same way when it comes to his two young daughters. In fact, they are the reason he started writing the KathIrene Kids Bible Book series — a set of books devoted to teaching the Bible …right up to the book of Revelation! 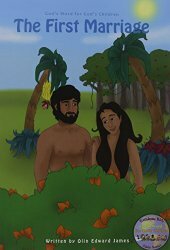 The third volume of this series, The Garden of Eden, was recently released, following its predecessors, In the Beginning, and The First Marriage. All of the books are formatted in easy-to-read and easy-to-comprehend poems, depicting for its young readers the events of the Bible. Each book not only contains trustworthy, biblical material, but also ends with a one-page challenge by the author, for the kids, and their parents, to apply God’s words to their lives. Miller’s ultimate goal is for children to read his books and realize that each story has a meaning — God’s meaning! Miller works part time for Mission Amish People in Savannah, Ohio. He lives with his wife and two girls in Ashland, Ohio, where they attend Southview Grace Brethren Church (Mark Abel, pastor). His pen name of Olin Edward James is a memorial to his grandfather, Olin; one of his father’s brothers Edward, who died in the Korean War; and his father, James, ‘one of the greatest Christians’ Paul has ever known. Visit his website kathirenekids.com to learn more about his ministry.